I recently visited Mission Valley Center and took a lot of pictures. This mall has undergone a lot of changes over the years. After this picture was taken, it grew larger and more upscale with the addition of Bullock's and Saks. More recently, it's become a hybrid with discounters like Target, Sports Chalet, Nordstrom Rack, and Bed, Bath, and Beyond. A nice complement to nearby Fashion Valley. 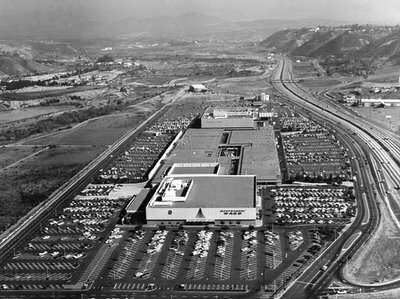 This Mall also has one of AMC Theatre's top grossing units, the Mission Valley 20. The 2nd Anchor there is May Company, later Robinsons-May and now Macy's. This mall is pretty cool in that you can park underneath it. They still have the original Speedramps to take you to the shopping level. I can't say I like the current design treatment of the place -- it looks like it was done on the cheap. At some time all the "festival" themed mall designs of the late 80's early 90's are going to look very dated.....then 30 years later we are going to look back with nostalgia. When I was a young lad (late 80s, early 90s) that giant Target was still a Montgomery Ward with the Electric Avenue department on the second floor. We bought our first computer from there in 1992, and we even have a sewing machine from that store that still works! My friends and I are trying to remember the large book store that was in the mall in 1968. It was just east of center, on the south side.